Embattled former Executive Director in charge of Supervision at Bank of Uganda Justine Bagyenda. 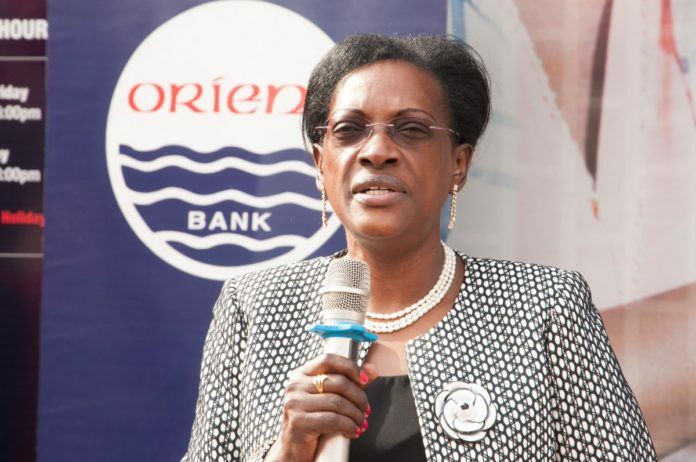 The former Bank of Uganda (BoU) executive director of supervision, Justine Bagyenda, transferred some assets and liabilities of Global Trust Bank Uganda (GTBU) to DFCU Bank after signing an agreement with Juma Kisaame, the then Managing Director of Dfcu Bank, Parliament’s Committee on Commissions, Statutory Authorities and State Enterprises (Cosase) established Thursday in the on-going probe of the central bank over the controversial sale of seven defunct banks. The MPs also established that Bagyenda signed the agreement document with Kisaame after sharing the confidential information of Global Trust Bank with him, which violates Section 40 of BoU Act. Discussions had been going on between BoU and potential buyers (Dfcu Bank). GTBU was closed on July 25, 2014 on grounds of undercapitalization and corporate governance weaknesses among other reasons. BoU legal counsel Margaret Kasule said BOU took over the management of GTBU in line with Section 88(1) of the Financial Institutions Act 2004. But using Section 95(1) (b) of the Financial Institutions Act 2004, Bagyenda and Dfcu’s Kisaame arranged for the purchase of assets and assumption of some of the liabilities of GTBU. On July 25, 2014, Bagyenda and Kisaame who represented Dfcu Bank signed a Purchase of assets and Assumption of liabilities agreement (P&A) where certain assets were transferred and liabilities assumed by Dfcu as per Article 10.2. The remaining assets were to be retained by BoU. “You are not supposed to discuss issues of a financial institution with third parties against section 40 of BoU Act. Why did you disclose the affairs of the bank with the third party?” Katuntu asked. BoU legal counsel Margaret Kasule who was put on oath, when asked by Katuntu whether she was consulted when Bagyenda sold the bank, replied in the negative. However she said her department drafted the sale agreement with Dfcu Bank. Bagyenda did not also consult with the BoU Governor Prof. Emmanuel Tumusiime-Mutebile. The Governor when asked by MPs expressed ignorance of the agreement between Bagyenda and Kisaame. Bagyenda also said there were no BoU minutes regarding the sale of Global Trust Bank. That was confirmed by the Auditor General John Muwanga who in his special report of BoU on defunct banks said negotiation minutes for the transaction were missing. Mr. Muwanga had been ordered by parliament to investigate BoU after former shareholders of defunct banks called for an inquiry, claiming unfair closure of their banks. When asked by Katuntu whether BoU was ever a receiver of Global Trust Bank, Bagyenda said: “No but we liquidate.” She said there was no bid or bid requirement. Under the agreement, it was agreed that part of the loan portfolio (assets in Escrow) worth Shs21.4 billion of GTBU not assumed by the purchaser (Dfcu Bank) would be managed by the purchaser as an agent of the Liquidator. Any proceeds realized from the assets would be shared between the Liquidator and the purchaser at a ratio of 65 percent and 35 percent respectively. According to the monthly collection report from Dfcu, a total of Shs6. 29 billion has been collected as at December 2017, with 65 percent of these collections amounting to Shs 4,093,052,663 has so far been recovered and transferred to GTBU recovery account in BoU while the rest remained with Dfcu Bank which now had become an agent of BoU. The balance of Shs15.13 billion was yet to be recovered. Further there was no third party to run the Escrow account, which means Dfcu Bank was doing it illegally. According to Wikipedia, An escrow is a contractual arrangement in which a third party receives and disburses money or documents for the primary transacting parties, with the disbursement dependent on conditions agreed to by the transacting parties, or an account established by a broker for holding funds on behalf of the broker’s principal or some other person until the consummation or termination of a transaction. In the transactions Dfcu Bank acted as a broker and principal. Dfcu Bank did not do the valuation of the assets of GTBU but depended on that done by Dfcu Bank. This wasn’t in accordance with the law under which GTBU assets were sold. Worse still, in his report, Mr. Muwanga noted that BoU transferred performing loans and overdrafts at Shs22. 6 billion, representing 80 percent of the book value of Shs28. 28 billion. This implies that Dfcu Bank acquired the loan portfolio at 20 percent discount. Mr. Muwanga says in his report that the evaluation of the alternatives and assumptions on which the evaluation was based were not provided for verification and therefore he could not determine the justification for transferring the performing loans at a 20 percent discount. However, total assets transferred to Dfcu Bank were worth Shs68,95 billion. They included performing loans and overdrafts, treasury securities and cash balances (both forex and current account in BoU). On the other hand total liabilities transferred under Bagyenda-Dfcu Bank arrangement were worth Shs70.98 billion.